The name Tarpy comes from Matt Tarpy, an Irish settler who in his day, was a well-liked vigilante living in present-day Watsonville. Tarpy sold a portion of his land to Sarah and Murdock Nicholson and not long after, a dispute ensued over property boundaries. Tarpy’s sense of summary justice got the better of him and he shot Sarah “accidentally” nine times! After being found guilty of killing Sarah, an angry mob decided it was Tarpy’s turn to pay. He was publicly hanged in an area now known as Tarpy Flats. The beautiful stone building that is home to our 3.5-acre restaurant was originally part of the Ryan Ranch family homestead. 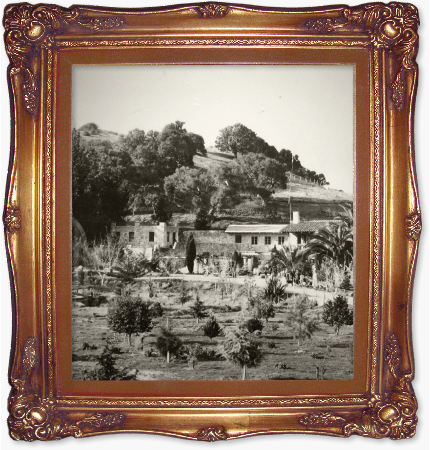 The structure dates back to 1917 when Mr. and Mrs. Charles Ryan bought 454 acres of rolling hills and meadows, then known as Saucito Ranch, and built their dream home. Through the years the building changed hands — present owners Tony Tollner and Bill Cox opened Tarpy’s Roadhouse in 1992. Born and raised in Monterey, Debbie has spent most of her life in the restaurant biz and served celebrities such as Lucille Ball, Carey Grant, Clint Eastwood and Merv Griffin. Debbie came to Tarpy’s in April of 1993, as a server, was promoted to manager in 1996 and became General Manager in 2000. Chef Andreas has spent the majority of his career in the Tarpy’s kitchen. Begining in 1993 he has dedicated his career to sourcing, local ingredients and crafting exceptional food. His talents shine through on desserts, where his artistry is on full display with items like Chocolate Espresso Bread Pudding and our Old Fashion Coconut Cake. Chef Andreas is a chef that will roll up his sleeves and do any job that needs to be done! Colleen began working in the restaurant industry at 17 and went on to develop a passion for the bar side of the business. She started experimenting behind the bar and has helped create a number of specialty cocktails. With 15 years of mixology under her belt as Tarpy’s Bar Manager, Colleen and her crew wow customers daily at Tarpy’s Bar, crafting new creations and pouring old favorites. California born, Rory spent the majority of his youth on his family’s Nevada ranch. He launched and developed his restaurant career at Carmel’s Rio Grill for 10 years as a senior server. In 2013, Rory moved to Tarpy’s where he helps manage the restaurant and oversees the extensive wine program. Whether you’re experiencing extraordinary service or enjoying one of Tarpy’s great wines, Rory’s professionalism and excellence shine through.